Clothing/Jewelry Description Blue pants and a white knit shirt with orange and lavender flowers. Distinguishing Characteristics Caucasian female. Blonde hair, blue eyes. Jackie has freckles across the bridge of her nose and one small freckle between her right thigh and pelvis. 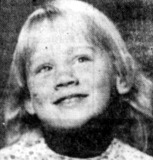 She had a small cavity between her upper front teeth at the time of her 1981 disappearance. 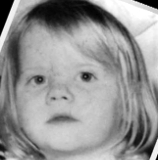 She has a small scar along her right eyebrow, and her hair was cut in a Dutch-boy style at the time of her disappearance. Jackie's family discovered she was missing as they prepared for an outing in Shawnee County, Kansas on September 12, 1981. She was last seen walking away from the Colfax and Golf Park in Topeka at 4:00 p.m. She was apparently being followed by a man at the time. She has never been heard from again. Police picked up a local man that same night and questioned him for hours about Jackie's disappearance, but released him without charge. Jackie lived with her parents and four older siblings in the 3000 block of Colfax in southeast Topeka in 1981. She was a kindergarten student at Avondale East Elementary School. Authorities did not begin searching for Jackie for four hours after her disappearance was reported. They believe she was most likely abducted, but few clues available in her case. Her mother died in 2007. Updated 6 times since October 12, 2004. Last updated October 30, 2016; picture added.